If there is one group of wildlife that responds quickly to your efforts, it has got to be the dragonflies and damselflies. 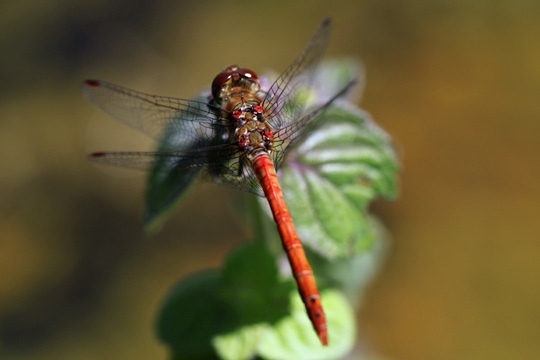 All you need is to put in a pond of moderate size in a fairly sunny position and you would be very unlucky for it not to soon heave with these stunning insects in summer. My pond is now two and a half years old, and so into its third summer, and I've just been visited for the first time by what is my ninth species of dragonfly, a Ruddy Darter (to add to my seven species of damselfly). 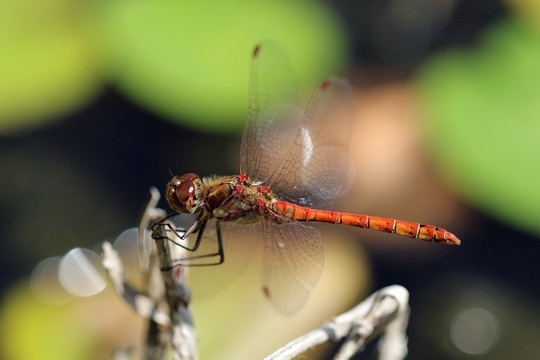 It is one of the more difficult species to identify, because it is very similar to a very common and widespread species which is just beginning to emerge in numbers right now, the Common Darter. The origin of the 'Ruddy' part of the name is pretty apparent - it is as if the abdomen is painted pillar-box red, with gloss rather than matt. But notice too how the abdomen (the 'tail') appears pinched near the body and them rather club-shaped at the read end. This one is holding its wings forward, as both Ruddy and Common Darter sometimes do (it's a way of actually cooling down by shading the thorax - they like to be warm, nut not scorching), but see how the abdomen has a somewhat more orangey and less glossy, and without such a dramatic pinched and club-tailed shape. It's subtle, and requires getting your 'eye in'. 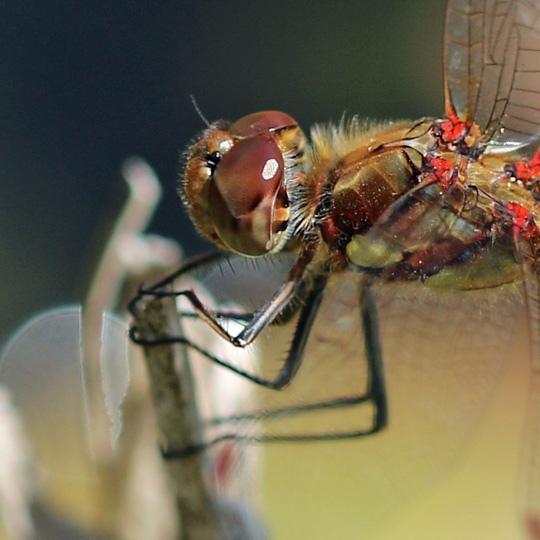 Common Darter has thin yellowish stripes on its legs, and bold yellow patches on the side of its thorax (the 'body'). Let's zoom in to see those better - you can hopefully make out the yellow stripes on the front leg nearest us, and one of the big yellow blobs just behind the 'armpit' of that front leg. Ruddy Darter in comparison has dark legs and dark sides to the abdomen. What I haven 't yet touched on is that two I've shown you are both males. The females and young males are even more difficult to identify, having rather an amber-coloured abdomen. So for now, let's just enjoy the beauty that is a dragonfly at close range, knowing that this is possible in almost any garden. 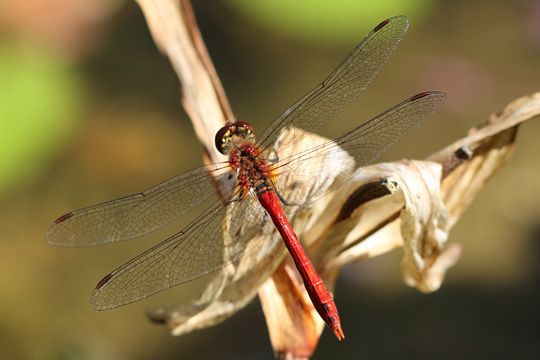 The Ruddy Darter is found across most of lowland England, Wales and Ireland, and the Common Darter extends right up to northern Scotland. Oh, and at the beginning I said 'all you need is a moderate pond in a sunny position'. So what does 'moderate' mean? My recommendation is to aim for a minimum water surface of about 50cm x 50cm (which is an area of about a quarter of a square metre, or 2.5 square feet). Washing-up bowl sized ponds are really too small, but the bigger you go, the more success you are likely to get. A 50cm x 50cm pond could be dug and lined in a day (if not by you then by a friend or relative with a bit of energy to expend), a metre square of good butyl or EDPM liner is only likely to cost you around a tenner, and I boldly (foolishly?) predict that at this time of year you'd have your first dragonfly visit within a week of it being filled. Now how good would that be for instant 'giving nature a home'? !